When it comes to wireless systems, a typical price for a great item of this niche falls within the boundaries of $300 to $400. If you want a cheaper options, several decent items can be singled out for around $100. But there’s also a region of $200, and that’s where you can find a variety of products that pack everything those high-end boys have, but still manage to sport a significantly lower price tag thanks to some clever budget cuts. The Relay G30 from Line 6 happens to be one such item, check it out! First and foremost, this is a digital wireless system, a modern tool with top level signal strength and reliability, and that’s a killer starting point. It boasts a 2.4 GHz frequency specialized for guitars, along with a broad frequency response of 10Hz to 20 kHz, and a superior 118 dB dynamic range. The casing is rugged, durable and fully roadworthy, while the price includes a transmitter, receiver, as well as all necessary accessories such as the cable, batteries and power supply. To protect the signal, the manufacturer added encrypted data streams, as well as simultaneous broadcasts on each of the six channels the device offers. A very important feature worth pointing out in our book is that the gizmo is compander-free. This means that the sonic output is far less compressed that when combined with a standard cable, securing superior sound and extra clarity. The device sports a set of standard controls, as well as a few nifty extra features to spice things up. You can choose between one of the six channels through a classic switch, which is regular stuff, but one option that caught our eye is the Cable Tone simulation switch. By turning this option on, the device will start simulating the tone of a cabled guitar. While some might think that it’s pointless to choose cabled tone over compander-free wireless connection, you have to take into consideration that many players have spent years – if not decades – on perfecting their tone through cabled connection. And sometimes, those players want their cabled tone directly replicated through the wireless system. And that’s where this feature gets to shine. The device has a range of around 100 feet (30 meters), and offers a somewhat weaker performance in terms of signal reliability than the $300+ models. Moving around too much – jumping and slamming around especially – can cause signal drops, and so can getting away from the transmitter. As for the receiver, a pair of AA batteries give this puppy up to eight hours of life, and we can put no complaints there. Sound quality is another good side of the G30, with very few differences to the company’s renowned Relay G50 model. So a major thumbs up there! For the listed price, this is a great deal. If you don’t play massive venues, you should have very few problems with this device. Sonic drops are rare, compression is non-existent, and reliability is high. If you want to buy a professional guitar wireless system but still save a few bucks (or 100), the Line 6 Relay G30 is a valid choice. Good stuff! 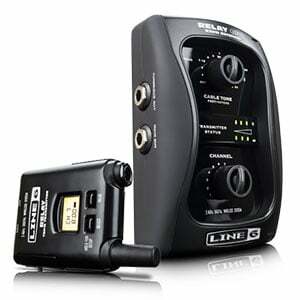 For more info about Line 6 Relay G30, click here. Why does my g-30 keep losing signal?